“Unstoppable tales from the inside of the inside — of his pals Johnny Thunders, Joe Strummer, Debbie Harry, Dee Dee Ramone, of Max’s, CBs and the long-ago Lower East Side, all told in a matter-of-fact style that only makes them more incredible. A definitive dispatch from the trenches (and gutters) of New York punk.” — Robert Duncan, Managing Editor, Creem. 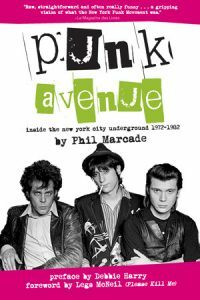 PUNK AVENUE: Inside the New York City Underground 1972-1982 is an intimate account of Paris-born author Phil Marcade’s first ten years in the United States, where—after drifting from Boston to the West Coast and back—he wound up in New York City and became deeply immersed in the start of the punk rock scene. 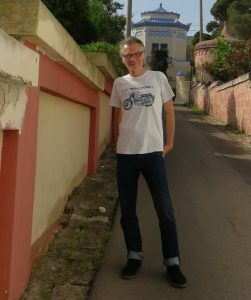 With brilliant, often hilarious prose, Marcade relays first-hand tales of his experiences, such as having the Ramones play their very first gig at his party, working with Blondie’s Debbie Harry on French lyrics for her songs, enjoying Thanksgiving with Johnny Thunders’ mother, and starting the beloved NYC punk-blues band The Senders. In addition to Marcade’s “raw, straightforward and often really funny” tales (Le Magazine des Livres), PUNK AVENUE includes a dozen rare black and white photos from the era, by renowned photographers Nan Goldin, David Armstrong, Marcia Resnick, and Eileen Polk. “Marcade’s book is historically important, invaluable in fact, but it’s also a fun, fast, nasty read. I couldn’t think of a better introduction to NYC in the days when the streets were dangerous, the rents were cheap, and the fun never ended.” —James “The Hound” Marshall, Bar owner, radio personality, collector, historian, new yorker…..
Phil Marcade was born and raised in Paris. At age 16, he got accepted in the most notorious art school in France, the Academie Nationale des Beaux Arts, but quickly dropped out and drifted towards Amsterdam. There he met Bruce, a kid from Boston, who invited him to come to the States for a couple of months. Marcade ended up staying there for 40 years. After a few crazy months traveling up and down Route 66 in a cloud of marijuana smoke, which earned him a short stay in a Federal Penitentiary, he spent some time in Boston where he became good friends with Nan Goldin, David Armstrong, and Cookie Mueller before moving to New York in 1975. There, he became the lead singer of The Senders, a Punk Blues Retro-R&B band he started in 1976 continued to play until 2001. Marcade was an active member of the Max’s Kansas City and CBGB’s New York Punk Scene since its beginning and befriended a lot of its notorious characters and musicians, like Willy DeVille (Mink DeVille), Debbie Harry(Blondie), Nancy Spungen and Sid Vicious, Johnny Thunders (New York Dolls) and Wayne Kramer(MC5). The Senders shared stages with such bands as The Heartbreakers, The Cramps, Suicide, The Ramones, The Clash and many others. The Senders released six albums and they were hailed as “Best Bar Band in New York” in the “Best of NYC” issue of New York Press. Marcade’s first book, Au-delà de l’Avenue D, was published in France in 2007, then in Italy in 2011. He now works as a painter and graphic artist and lives in Bologna, Italy.